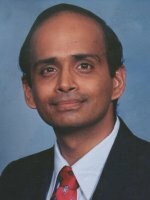 Congratulations to Ram Devanathan on being invited to attend the 2007 German-American Frontiers of Engineering Symposium, organized by the National Academy of Engineering and the Alexander von Humboldt Foundation. About 60 engineers, generally not older than 45, from German and U.S. industry, universities and national laboratories were invited because of their innovation, articulation, and leadership. A Senior Research Scientist at Pacific Northwest National Laboratory, Ram performs leading-edge research on fuel cell electrolytes for the hydrogen economy, radiation-resistant semiconductors, nanoscale phenomena and novel radiation detector materials. By gathering up-and-coming engineers and challenging them to think about problems and developments at the frontiers of brain research technologies, robotics, smart materials, and space technologies, the symposium hopes to transfer new techniques and approaches across fields, and build connections among the next generation of leaders in engineering. The symposium will be held April 26-28, 2007, in Hamburg, Germany.